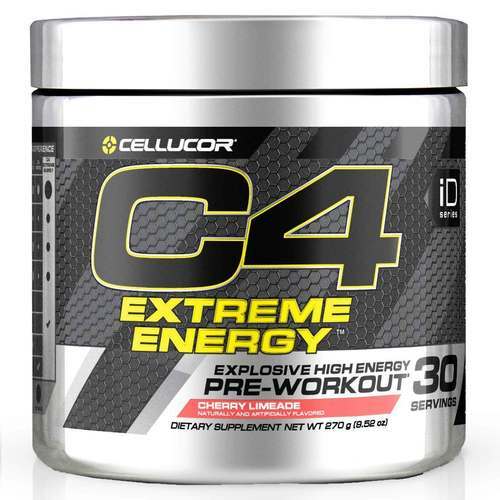 C4 Pre-Workout by Cellucor comes in a wide range of flavors so you can choose which one fits your taste. Advertências: Do not take if you are currently taking nitrates for chest pain or if you are taking medication used to treat erectile dysfunction such as PDE-5 inhibitors. This product is only intended to be consumed by healthy adults 18 years of age or older. Before using this product consult with your physician if you are pregnant or nursing, or if you are using any prescription or over the counter medication or if you have any pre-existing medical condition including but not limited to, high or low blood pressure, cardiac arrhythmia, stroke, heart, liver, kidney or thyroid disease, psychiatric or epileptic disorders, diabetes, recurrent headaches, enlarged prostate, difficulty urinating, glaucoma, or if you are taking a MAOI (Monoamine Oxidase Inhibitor), antidepressants, aspirin, nonsteroidal anti-inflammatory drugs or products containing phenylephrine, ephedrine, pseudoephedrine, or any other medication. Contains caffeine. Do not use in combination with synephrine, caffeine or any stimulants from other sources whatsoever including but not limited to coffee, tea, soda and other dietary supplements or medications containing phenylephrine or caffeine. Discontinue use and consult your health care professional 2 weeks prior to surgery or if you experience rapid heartbeat, dizziness, severe headache, shortness of breath or any other adverse reaction to this product. Do not combine with alcohol. Do not exceed recommended serving. Do not use for more than 8 weeks. Keep out of reach of children. Notas: This product may contain legal dietary ingredients that are prohibited by individual sports organizations. Due to the unique restrictions of some amateur and professional sports organizations, obtain approval and/or authorization before beginning use of this product. Recomendações de uso: Take one serving (1 Scoop) of C4 Extreme Energy mixed with 6-8 fl. oz. of water 20-30 minutes before training. During workout, it is recommended that you drink plenty of water or performance veverage such as Cellucor Alpha Amino to stay hydrated. Some individuals experience a harmless tingling sensation, which is attributable to beta alanine. USE ONLY AS DIRECTED.